Located in the heart of Quincy Center and within walking distance to public transportation (¼ mile walk from the MBTA red line Quincy Center T stop.) Ross Parking Garage is located directly behind the building and provides ample parking. Several new apartment and condo developments are currently in progress in Quincy Center. 18,000 sq ft second floor serviced by elevator. Building description: Open retail space on both the first floor and lower level; the selling basement has HVAC, lighting, ample ceiling height, and two staircases serving it from the first floor; great layout for a furniture store and a variety of other retail uses. 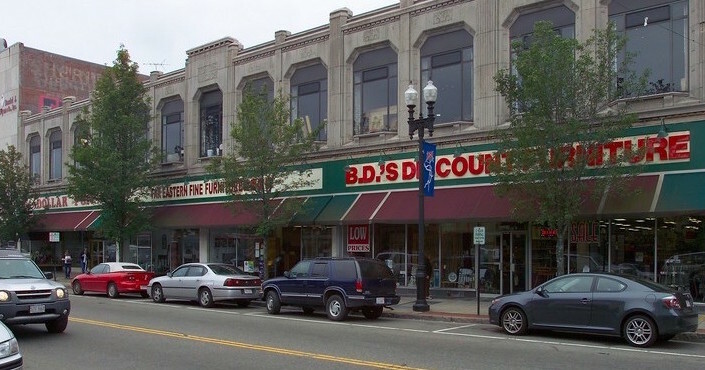 Location: In the heart of Quincy Center surrounded by retail, office, and residential properties; ¼ mile walk from Quincy Center T stop; easy access to routes 93 and 128. Other charges: NNN’s approximately $7.00 sq ft.